To many of our generation, Austria is the land of 'The Sound of Music', and we had a hard time separating it from Julie Andrews' melodic voice. The scenery is as beautiful as seen in the movie, and there is much more than snow-capped Alps. We crossed it from north to south in the Fall of 2003, and from east to west in the Spring of '04. It was full of majestic mountains, beautiful palaces, and many memories of European opulence as it was in the 1700-1800's. Austria, the center of the Austro-Hungarian Empire at the end of the 19th century was reduced to a small, but well-off republic after being on the losing side of two World Wars. Our impression of Austria is a well-disciplined and wealthy country, people are friendly but not effusive, very much like Germans. Prices since they joined the EU are similar to elsewhere in Europe. A small, neat city spread out along the valley carved by the Inn river between high Alps to its north and south. 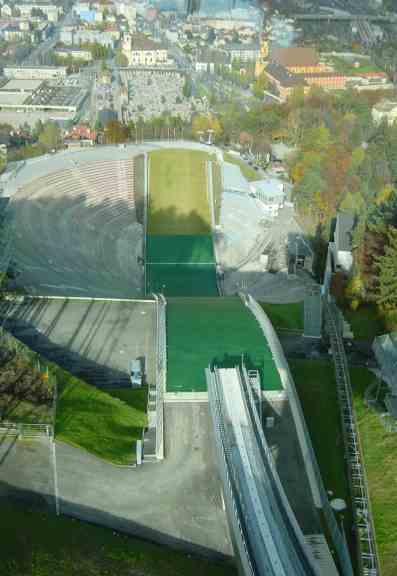 The scene of Olympic winter games, it is dominated by a huge ski jump with a panoramic view of the city and the high mountains beyond. A pedestrian mall occupies the center of this quaint city, with boutiques, souvenir stores, pastry shops loaded with strudel, and many restaurants. We stayed in a small caravan park to the west of the city, and used their excellent buses and trams to visit all parts of the city. Deeper in Tyrol we found a cute vacation lakeside town where the locals go to swim in the summer and ski in the winter. It was only November, but the skiers had taken over as they returned to the campsite at the end of the day with skis strapped to the roofs of the cars. The caravan park was on the shore, and our site had a great view of the clear water with the Alps as a backdrop. We got our exercise by walking around the lake to the town, and window-shopping for souvenirs and un-necessary trinkets. 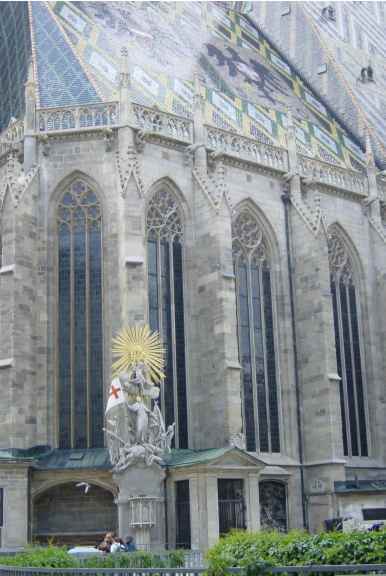 Vienna was slightly overwhelming, with the most beautiful buildings than we have seen to that time. There are museums, government palaces, cathedrals, statues, and evidence of Mozart everywhere. We walked a lot, winding through the pretty backstreets, somehow always ending up at Stephan Platz, the central square and home to the Cathedral dedicated to St. Stephen. One of the features of the city is the Spanish Riding School, a training venue for the Lipizzaner horses. The show reminded us of the opulence of the 18th and 19th century, as trainers and horses put on indoor shows for royalty and their guests. In this case we peasants sat in the upper boxes and hung over the balcony getting a bird's-eye view of the precision moves of the well-disciplined horses. Salzburg is another medieval castle with a 20th century city surrounding it - and tourists vying to get to the castle. We drove (and got lost) in it twice while going through to Berchtesgaden. 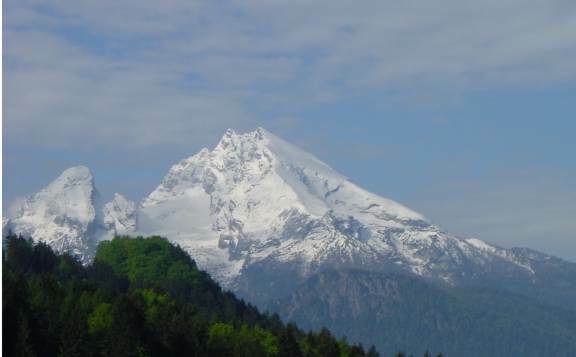 Technically a 'peninsula' of Germany protruding into northern Austria, it is a spectacular valley surrounded by high snow-capped mountains that attracts many travelers as well as locals - like Adolf Hitler. He and other Nazi leaders built chalets high in these mountains, but Allied bombing destroyed them during WWII. We did not manage to take the elevator that now whisks you to a restaurant at the site of the old 'Eagle's Nest'. 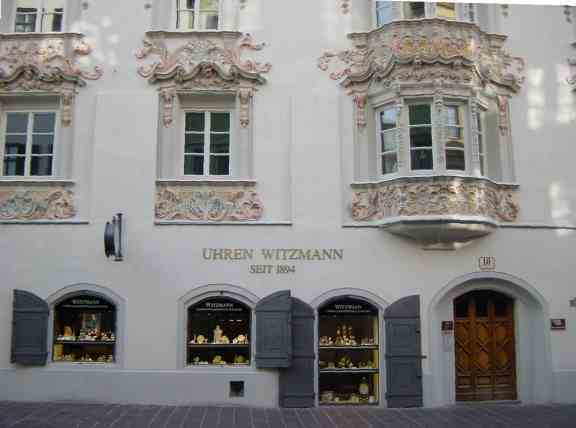 For more on Austria see our November 2003 and May 2004 Journal entries.